The scripture is quite clear about rapture - the change of our bodies - but many people go about it differently. It is not a question of an individual belief, but rather what the Bible says about it. Two things: first fruits and the general rapture of the church, those who are born-again and know the Lord and have the assurance of salvation. This never changes. The rapture subject is being disputed theologically in different denominations. Hence, everyone must be led of the Spirit individually. On the judgment day no pastor or leader will answer to God for their flock, but each will answer for himself individually. Even the Pope will only answer for himself and not for the millions of Catholics. From the Biblical point of view having a leader that stands to represent a group of people or even a nation, like Goliath did represent the Philistines; is not scriptural but pagan. Unlike all other nations, the Jewish nation is composed of individuals. Each individual keeps that uniqueness separate from an amalgamated group. Hence, as the saying goes, "where there are two Jews there are three opinions." As a surprise, those who do not know that the Jews wrote the Bible, no monolithic doctrine has ever been developed in Judaism, that's typical of the Gentile Christianity developed since the time of Roman Emperor Constantine. 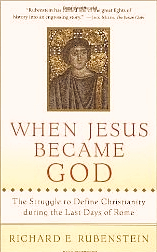 Richard E. Rubenstein takes readers to the streets of the Roman Empire during the fourth century, where a divisive argument over the divinity of Jesus Christ was underway. Ruled by a Christian emperor, followers of Jesus no longer feared for the survival of their monotheistic faith, but they found themselves in different camps—led by two charismatic men—on the topic of Christian theology. Arius, an Alexandrian priest and poet, preached that Jesus, though holy, is less than God, while Athanasius, a brilliant and violent bishop, saw any diminution of Jesus' godhead as the work of the devil. Between them stood Alexander, the powerful Bishop of Alexandria, in search of a solution that would keep the empire united and the Christian faith alive. Time: When Jesus was on earth He was only man until He permitted God within His body to completely take over His being. I.e., temptation in the wilderness, Gethsemane, not opening His mouth when He was beaten, forgiving His enemies, laying down His life willingly and then taking it back again. He fulfilled His mission as a flesh-and-blood man. So the physical figure of Jesus is not God. If He came from God and then went back to God than who remains as God, the one from whom Jesus came and returned to, or the extension of God, His child, son? Example: When you are a father having a son then the son is not the father is he? But if you are a human being then your son is also a human being by having human body. But if you overcame all sin and conquered death, was translated like Enoch was; and became one with God, but if your son did not overcome and died; then he is still your son, but not one with God as you have become. E.g., Enoch's son Methuselah was the longest living man on earth 939 years. Why? - Because God's grace that was on Enoch - his father - was indeed great, but Methuselah died. Is Methusaleh Enoch? No. Therefore: when we return to God as overcomers we become one with God hence we are also sons of God, but not as the Firstborn, but as siblings of Jesus. We are not gods, we are human beings, until we overcome. Because we are living in the zone of time and locale, physically, we have a hard time bypassing identities. Everyone wants to make a mark and pass down into history as someone - identity. Spirit has no self-identity; therefore, Jesus had no self-identity; He had the Father-identity as Ben Adam. Now that He is back in the heavenly spiritual realm, He is one with the Father - God the Spirit, being as one Spiritual entity. But the moment Jesus appears on earth - because He once had a physical body - we can see Him in this physical dimension through His former earthly identity. Under Constantine Trinity came first and then discussions about the Father and Son, who is greater or equal. But that was done without Jews, but purely under pagan systems of thinking. God allowed it because Judaism was too complex and too heavy - too much man and too little God in it. Christianity became separate competitive "better than Judaism" religion, from which anti-Semitism originates. But, Christianized paganism remains, in many sectors like: veneration of saints, statutes, crucifix, unmovable beliefs systems etc. If we did not have those official holy doctrines like the Holy Trinity, (Perhaps it should be Quadrinity, because angels are also part of Holy Unit of God) and Jesus being God, we would not have this discussion. It all remains personal and subjective. Even a parent will not answer to God for his or her children; hence the theology of baptizing babies is also wrong, but again, here we bump into theology of different denominations. First fruits are the overcomers, who already come and go according to God's will. There were many that have already been translated (individuals) never groups like e.g., a church that is under a rapture doctrine. God does not deal with groups. He always chooses individuals. Those individuals than preach the word and affect crowds because amongst the masses are some individuals, (God's [lost] seed, sons) who God is seeking; hence prodigal sons (individuals). Based on this, a general rapture of the church is being disputed. Will all Catholics go in the rapture, all Lutherans or Calvinists, Methodists, or perhaps only Baptists, or Pentecostals? This is a difficult question, which must be left up to God. Hence, my ministry Luxum Light concentrates on the individual. God's children are rather lazy and slow, and because they have been already smoked (like smoked fish) in different houses of theology, it is difficult for them to get that old smoke out of their system. This is my problem too, it's all too slow for me; because people rationalize things instead of experiencing (like children) things with opened up minds; only then God's gift of faith is given to them to serve Him. The hirelings are more aggressive. They raise funds quickly. Build churches and TV networks, the are being motivated by work and rewards; and God uses them. They make lots of money for the Kingdom, and the people (flocks) are well fleeced and they "like" it. The "Faith & Prosperity" message works, the preachers are rich, but the sheep are also doing great, starting new businesses and prosper. They are not bitter, disappointed, or even envious. That's the reason those churches grow; for if the sheep were losing money, or were getting poorer; then they would not come back and make the church grow. Would they? So we see many churches in Asia, which are modernistic, (Christian fashion, hip…) It works. Popular doctrines work. Religious attractive entertainment works. And why not? None of us are perfect yet, otherwise we would be raptured already. So it is not in the head, or a question of a belief. So mulling over the rapture belief is useless, because Jesus will come like a thief in the night; anytime. As an additional note: Do not study the Book of Revelations. Too many people got lost in it already. It has confused and still confuses many today. Politicians know these teachings better than an average Christian does. What would happen if the 7 year period is not exactly 7 years but 8 or 10? Perhaps then the theologians would scratch their heads and search the Scripture again trying to fit it all into their own individual theologies and ideas. It's a waste of precious time on speculations ([Acts 1:7-8] It is not for you to know times or epochs which the Father has fixed by His own authority). Man has the free will and to spite all to those "religious fanatical fools" they might change the time like one of the popes did. The 3 1/2 the 7 years, the four horses... all of this has already been fulfilled-so there is an army of believers believing it to be so also. I saw an amazing presentation by a reputable Bible Scholar who chronologically & historically showed this to be true. The Dome of the Rock is also the Abomination of Desolation, of which Jesus spoke. Why? - Because "Arab" means desolation, desert and wilderness, as well as ambush. That had happened in 660. The original Greek test (Revelations) reads the number 666 as 660. Etc. Waste of time. Go after God's wisdom only. If you found it already, then stick to it! That's repentance, SHOOV, firm return to God - to His straight and narrow way. More on "Rosh & Akev"